Whether you are redoing your kitchen or updating your fridge, it can be a difficult and overwhelming task to find a refrigerator that fits your needs within your budget. To make your choice a little easier, we decided to review KitchenAid’s 25.8 cu. 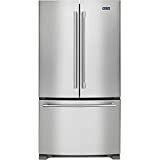 Ft. French-door refrigerator, model number KRMF706ESS. We will take an honest look at the refrigerator and provide an overview of its features, consumer pros and cons, and give our rating and recommendation based on comparisons with similar models. 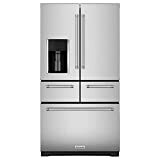 The KRMF706ESS is a 36” freestanding French-door refrigerator, manufactured by KitchenAid. It has some exclusive features, which add to its versatility. This particular model of refrigerator has an attractive, professional designer appearance and comes in a brushed stainless-steel finish, complete with stainless restaurant-style bar handles. For our purposes, we are focusing on the stainless-steel finish. It has an attractive and easy clean platinum surface. The interior is optimized for storage and functionality. It features two independent cooling systems to help keep food fresh longer. This is not your average apartment refrigerator. The design, inspired by professional level appliances, was created with a sharp appearance that is classy enough for luxury homes but still sold at a more affordable price. It comes in either the tried and true classic brushed stainless-steel or black stainless exteriors. The handles are sturdily attached beefy metal bars, and they feature the KitchenAid trademark red circle on the end caps. The glossy platinum interior complement the other metallic finishes. The door hinges are hidden so as not to detract from the finished appearance. Because KitchenAid wants you to have the very best, they designed this refrigerator to run on two independent cooling systems. One system runs the refrigerator section for optimal conditions for your fresh food. The other cooling system controls the freezer section, keeping the temperature at the perfect level for maintaining frozen food without the worry of freezer burn or waste. 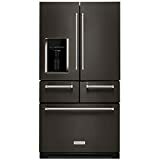 This KitchenAid French-door refrigerator features LED lighting in every compartment. The lights, though bright, ramp up gradually to their full intensity. This is easier on your eyes than a sudden blast of light. The LED light offers a crisp, clear white glow and is totally maintenance free, as opposed to incandescent bulbs found in traditional refrigerators. KitchenAid touts their 5-door configuration as “revolutionary” and as a “breakthrough in organization.” This is because it features two soft-close pantry doors on the main compartment and three soft-close drawers below, each with LED arena lighting. This allows each section to be accessed independently and keeps items where you can see them easily. Each section can also hold a different type of food, so if all you want is an apple, for instance, you need only open the drawer on the right that is the Produce Preserver. If you want to grab a string cheese for a quick snack, open the cheese drawer on the left . The drawer on the left is designed to maintain one of five different temperature presets for specific types of food. The preset selections include meat and fish, perishable greens, beverage containers, deli meats and cheeses, and thawing and marinating. The drawer on the right has a Produce Preserver feature which helps create the proper temperature and humidity to prolong the life of produce such as carrots, cabbage, apples and much more. The soft close feature prevents jarring or slamming. A simple nudge from you, and the drawer pulls itself to a complete, and completely quiet, close. There is a dedicated compartment with temperature and humidity control just to preserve herbs such as rosemary, basil or cilantro. Keeping them separate from other foods also prevents your strawberries from tasting like dill or your cilantro from tasting like bananas. The unique freezer drawer features three tiers rather than the usual two. This will help prevent items disappearing into the bottom of a single large bin, only to be found later covered in nasty freezer burn. The upper bin holds items such as trays of meat, popsicles, and packages of that size. The middle drawer works well for containers of frozen vegetables, ice cream or other smaller items that may get lost in a basket bin. The trays can be pushed back independently to expose a deeper bin basket on the bottom. The bottom basket comes with a divider to help with organizing things such as microwave dinners, frozen lasagna, freezer meals, etc. The two inner crisper drawers have a special SatinGlide® mechanism which allows the drawers to roll in and out smoothly without sticking or jarring. This makes using the crisper effortless. Inside this amazing fridge are four adjustable shelves in the main compartment. The bottom shelf is continuous and stationary, but each of the other four shelves is moveable and made of tempered glass for easy cleaning and higher visibility. The shelves do not have a lip but have been nano-etched all the way around to help prevent spills. There are several shelf height adjustments allowing for shallow platters or taller bottles. There is even a special slot to fit a pizza box. There are also four adjustable shelves on the doors. These gallon-size, bin-style shelves are clear for easy visibility and are dressed up with a metallic band to match the interior. There is an ice dispenser built into the French-door on the left of the refrigerator so there is no need to open the door to get ice from the interior icemaker, which you can program to give you up to 20 percent more fill per use. No need to buy bottled water because there is also a water dispenser that allows you to get fresh filtered water without opening the door. This unit has one more unique feature – the Measured Water Fill which allows you to automatically dispense the water in specific amounts; liters, cups or ounces. Imagine the convenience when cooking or mixing drinks. This could be a great time saver in the kitchen. This is the interior icemaker, located inside the left side French-door. The In-Door® Ice System allows you to quickly and easily access fresh ice whenever it’s needed without taking away room from the shelves or having to bend down to the freezer compartment. The ice is made from filtered water, so it is sparkling clear and leaves no sediment in your drinks or glasses. You can set the ice maker for either cubed or crushed ice. The KitchenAid KRMF706ESS is not priced for budget kitchens. 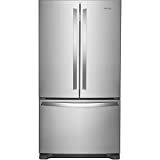 It is a mid-range refrigerator and priced as such; however, we found KitchenAid has a couple of other French-door models that sell for a bit costly, so this model is a great deal. We found this KitchenAid refrigerator at a few retailers with a bit of a spread on the price tag. We are going by the regular retail price, although you may obviously be able to find a deal somewhere. For comparison’s sake let’s look at it alongside a few other French-door refrigerators in the same price range. Our star ratings are in comparison to the KitchenAid model. As you can see in the ratings below, the KitchenAid model has the best warranty. It also rated lower in energy consumption than the Whirlpool model. It was a hands-down winner in the number of features it offers. Now that we have introduced you to the KitchenAid model KRMF706ESS, let’s evaluate some pros and cons. With so many refrigerators on the market, it can be difficult to pin down just what you may want. Smaller capacity refrigerators with an upper, interior freezer can be found for just a few hundred dollars and can be a great fit for budget housing, or for a second fridge for a garage or storage room. You can find massive, double-wide restaurant style refrigerators with all the bells and whistles for the price of a small car. We feel that this KitchenAid model is definitely in the upper ranges for quality, features, and appearance, but in the mid-range for price. This striking refrigerator would give the professional look of a chef’s kitchen to any home. This refrigerator offers some unique features such as a special drawer for keeping your herbs fresh and flavorful and an out of the way slot for a pizza. The filtered, in-door water dispenser will fill a glass but has the added perk of being able to dispense specific measures of water, so you can make coffee or prepare recipes without adding the extra step of doing it yourself. The interior lighting is superior. The bright LEDs provide a clear view of every space, but they come on gradually so as not to shock the eye. Because they are LEDs rather than the incandescent lights seen in other refrigerators, they are virtually maintenance free. The clear shelves and bins in the fresh food compartments combine with the lighting to create a display-like feel when you open the doors. The two exterior drawers provide great versatility for their use. The one on the right has a Produce Preserver system to control humidity and temperature and also comes with a divider to help with organization. The one on the left is designed with five environmental presets, allowing you to choose what you want to store in the drawer. There is a convenient control panel on the top edge of the drawer. The only real drawbacks we found are the smaller capacity of the icemaker. Most negative comments from consumers have been related to that component; either that the icemaker sometimes doesn’t work or there is an occasional leak. Most other issues were related to improper installation, the owner not understanding how to operate the appliance, or some random glitches. Overall, we would give the KitchenAid model KRMF706ESS five stars and a big thumbs up. This KitchenAid model is definitely in the upper ranges for quality, features, and appearance, but in the mid-range for price. Furthermore, the only downside that we have found is the smaller capacity of the icemaker.